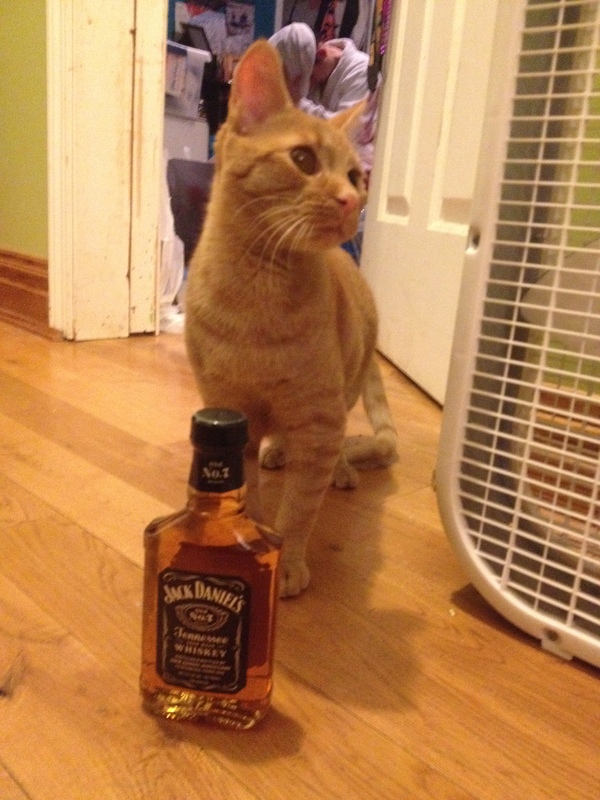 Retrospectively, I spent a lot of time during my college career at frat houses, parties, and under the influence. But isn’t that the college way of life? During my four years I gained a reputation that one of my idols would have been proud of. I was a drunken party girl. I would walk down my dorm room floor at 7 pm on a Monday night and convince people that they should take shots with me. I was a master illusionist that showed them how a drink could solve there problems at 9pm, however I never showed up to help them get too clinical at 5:30 am. I was the girl who was lying on the common room floor with kaleidoscope eyes, telling you that in a galaxy far, far away there was life. I was the person who swore like a sailor, dressed like a blind man, and drank like I would never live to see tomorrow. Wanna see highlights of my Drunk College Career? Click here. During my 4 year of college Ke$ha was my role model. Her words spoke to me, partying, drinking, waking up in closets, glitter, feeling like P. Diddy, who didn’t want to be Ke$ha? I would parade around in the silliest of outfits, not caring what other people thought, spreading a trail of glitter wherever I may have traveled. I even had my own theme song which mirrored Ke$ha’s current hit at the time, Tik Tok (Maybe one day I will share it, or even do a video playing it). And while I never brushed my teeth with a bottle of Jack, peppermint schnapps will have to suffice. Parading around with the pride of Ke$ha supporting me, really helped me find my confidence in college. I did not care what anyone said about how I dressed, how I acted, or the way that I expressed myself, I was playing Ke$ha and I was happy! Sure sometimes my shenanigans got me in trouble, like drinking before sporting games, or frequently skipping my 8am class. However I did graduate this past December with a 3.5 GPA, a major in Forensic Psychology and minors in English and Criminal Justice, and a few certificates to throw into the mix. 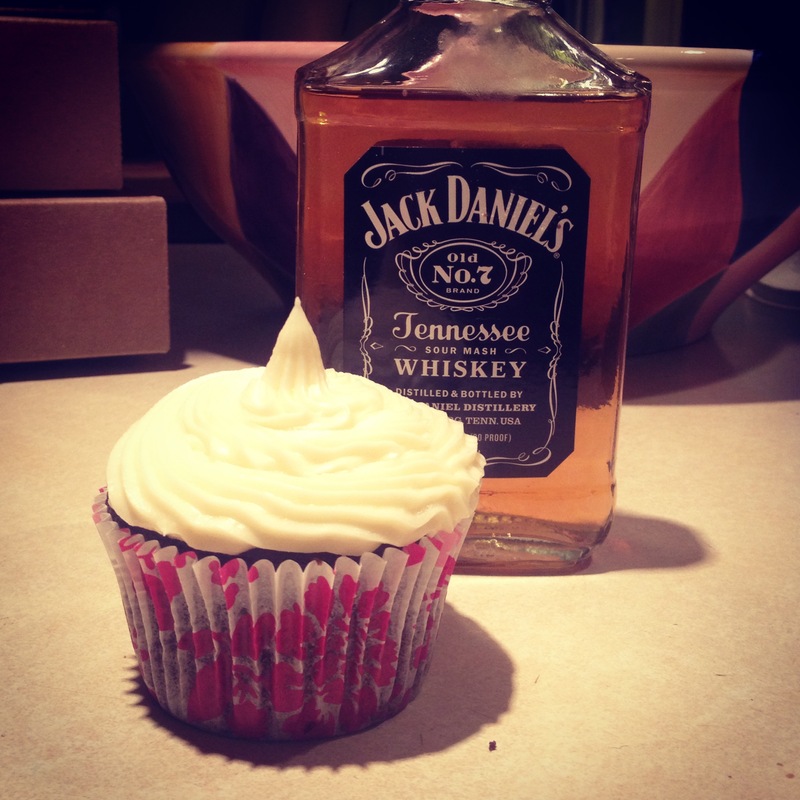 Today with the Super Bowl approaching, I decided to make Jack and Coke cupcakes. However I could not help but think of my college role model the entire time making them. These cupcakes featured a chocolate coke base, with a Jack Daniels butter cream icing, sure to give you that afternoon buzz you need. These cupcakes, due to the soda, come out as light as an empty bottle, with as much flavor as the soda you just guzzled to get that empty bottle. While I am not a Jack fan or a Coke fan, there are some things that were meant to go together, and Jack and Coke is one of them. I confess, I cheated again!!! I used a box mix for the Coke cupcakes. There are recipes out there on how to make a coke cake from scratch, but if you are like me and don’t feel like running to the store at 8:30pm after the gym this will suffice. Makes 15 Cupcakes, Frosts 12 nicely, stretches to 15. Mix the cake batter and the 12 ounces of soda, this will replace the eggs and oil and whatever else the box calls for. Follow directions on the box for baking times. Cream the butter, mix in the vanilla and milk. Slowly mix in the confectioner sugar one cup at a time. Mix in the Jack and frost! I’m cooking up something amazing tonight…. 4 million dollar, 4 million, that’s how big my mistake was at work this week. Needless to say I am stressed, and when I’m stressed I eat. On Monday I found myself pacing back and forth outside of a conference room because I wanted left over cookies from their lunch meeting. There were no leftovers. I raced up and down the aisles at work to get a small bite of chocolate, no one had any. When I was stressed and needed it the most my work let me down. Cookie dough… Reminder: do not eat all of it. I decided I was going to make a sweet treat for me, I mean everyone at work. I also lost a bet to one of the departments and promised them cupcakes. But the thing is, on Tuesday when I came home from the gym, I realized I did not have enough butter for a butter cream frosting. I also did not have any cream cheese for a cream cheese frosting. And on top of all of that it was 8:30 pm, I was not going out to get anything. So I settled with cookies. 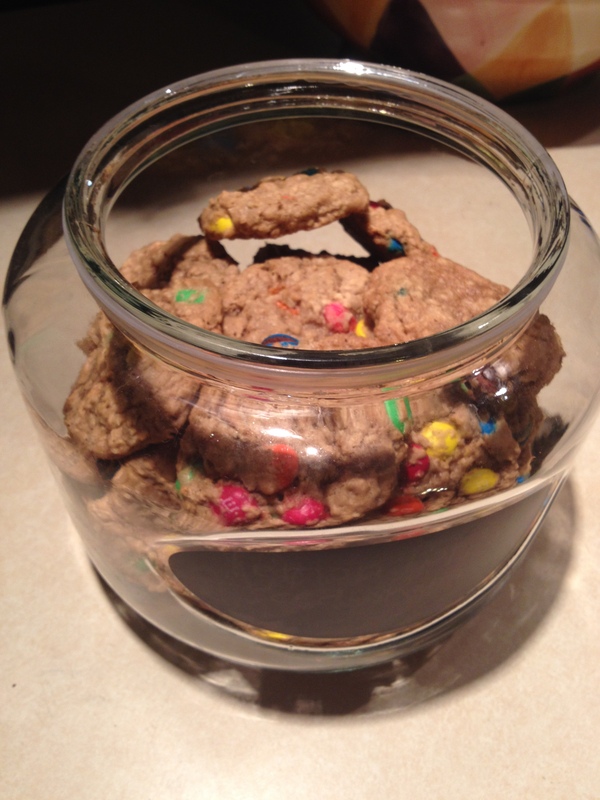 What I really wanted to make was double chocolate chunk espresso cookies. Well, let me tell you, I did not have anything to make that. No espresso, no Dutch processed coco, and not enough butter. This whole baking thing was starting to stress me out almost as much as my 4 million dollar mistake. TO THE INTERNET! I don’t often borrow recipes from the internet but when I do I make sure the recipe is legit. 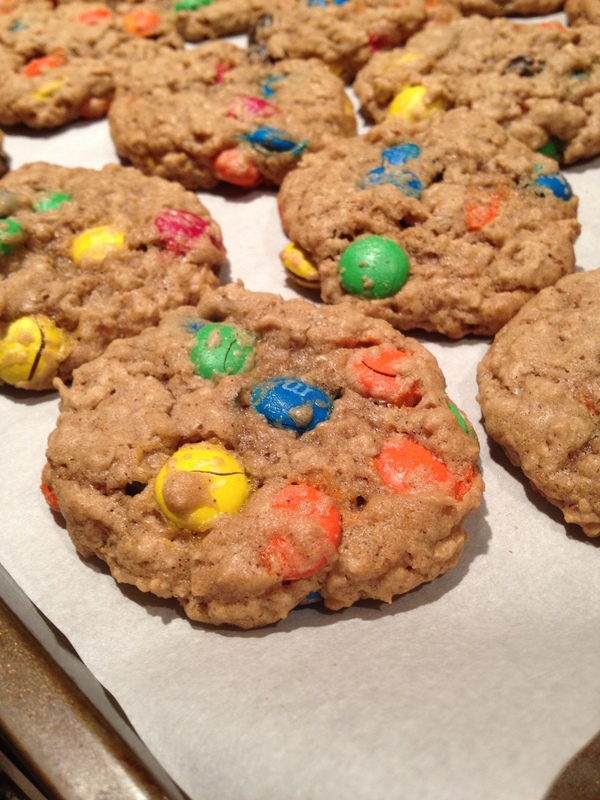 I borrowed Chewy Oatmeal M&M cookies from Sally’s Baking Addiction, AND MAN DID THEY COME OUT WONDERFUL! I made two batches, one for my work fellows and one for the house. For the first batch I followed the recipe to a T. I was pleased how they came out however the cinnamon was throwing me off, something with the cinnamon and the chocolate was not working for me. However it did take me 3 cookies to decide this. For my second batch I dropped the cinnamon and added another teaspoon of vanilla. These came out much better for my liking. 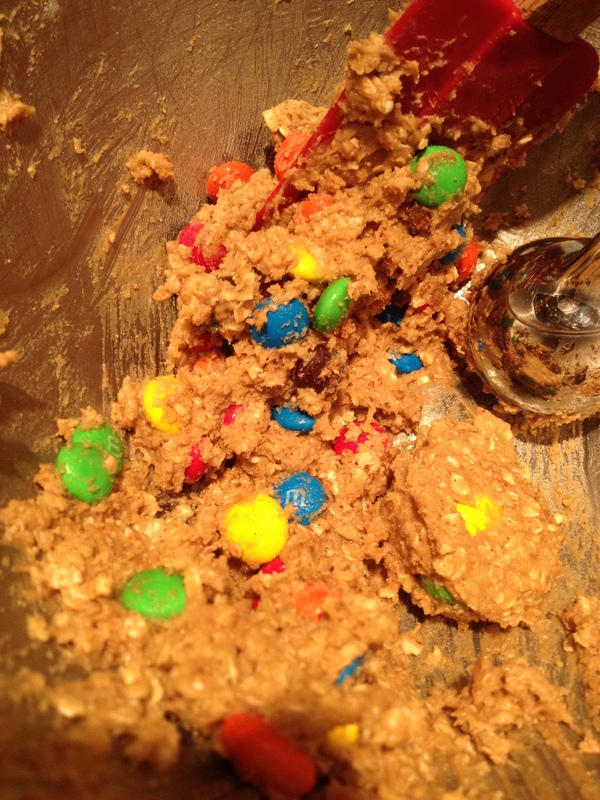 Chewy, soft, hearty with the oatmeal, and still sweet with M&M’s thrown in. A perfect distressing snack. With a stand mixer cream the softened butter and the sugars, add the eggs and vanilla and mix. These were a hit at work!